Allan Zola Kronzek is not your stereotypical magician. During a recent conversation at his house in Sag Harbor, he neither pulled a rabbit out of a hat nor sawed his wife, Ruby Jackson, in half. 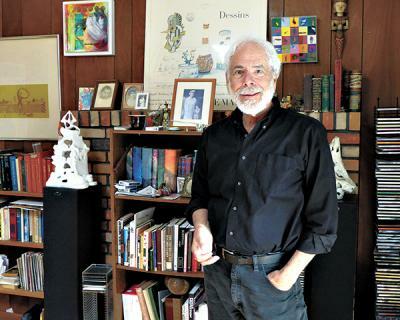 It became clear very quickly that he is a scholar who has written four books, with a fifth on the way, and whose “act” is steeped in the history and psychology of magic. But he does tricks, too. Because his preferred venues for his magic act are museums, libraries, and schools, “the hook for my show is the history of magic. I’m an academic at heart.” He works on Long Island and in the city, teaches magic at the Ross School summer camp, and sometimes does strolling magic at parties. A PowerPoint presentation he uses in his historical shows includes the earliest known image of a magician, which dates from 1405. That figure, too, is manipulating cups and balls. There are also paintings by Bosch and Breughel that include magicians. Magic from the Middle Ages evolved, Mr. Kronzek explained, with the advent of the scientific revolution, “which changed the way people thought about magic. Magicians began to perform at fairs and in rented theaters in the 1700s.” His programs usually conclude with the early-20th century. When he was a teenager, he had a show for 8-year-olds and became a junior member of the International Brotherhood of Magicians in Pittsburgh. “I was exposed to more sophisticated card magic there. The world opened up a little, and I was lucky there was a used-book store near my home that was owned by a magician. There was a big magic shelf, and I bought a lot of books.” Not surprisingly, books, not props, fill several bookcases in his study.